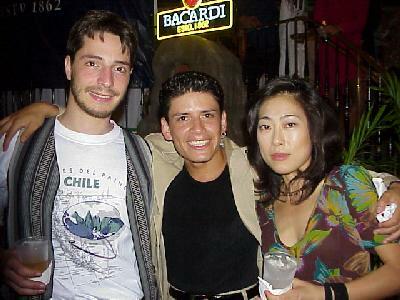 Guest Pierre, Dancer Luis Vasquez, and Guest Hiroko Tezuka. Pierre is from France. He came from Chile, where he was living, to be at the Congreso. Luis is from Los Angeles and is part of Salsa Brava. The Salsa Brava web Page was located at: www.salsaweb.com/salsabrava. Hiroko is from Japan. She came from New York to be at the Congreso. A true expression of the salsa mix.